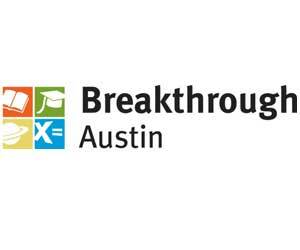 Founded in 2001, Breakthrough Austin builds a path to college for low-income students who will be first-generation college graduates. Breakthrough’s philosophy is built on the belief that there are no quick fixes and that early, long-lasting interventions can make the difference between dropping out of high school or going to college. This is particularly true for students whose families have limited English skills and no history of collegiate achievement. Recognizing the importance of building knowledge, skills, and expectations through early intervention, the program makes a long-term commitment to students and families. Through this sustained approach, Breakthrough provides individualized and comprehensive support, academic preparation, and the information and advocacy families need to negotiate the complex steps needed for students to be college-ready, gain college admission, and secure financial aid. We believe that by providing innovative, educational programs to children and their families, we can replace the cycle of poverty with self-sufficiency.